As I was driving to work the other day (or to be more specific, sitting in traffic waiting for it to move along), I was sitting behind a pickup truck for a concrete company or a construction company or something like that. A part of the back window of the cab was broken and they had a piece of plastic and insulation over it, and I was thinking… “Good thing they don’t live up North, they wouldn’t be happy with that broken window with all the snow they are gonna get.” My brain then went into a tangent on the south, and weather, and why is it getting so cold. And I then started to think how isn’t it crazy that I grew up in Cincinnati and how I am such a southern convert when it comes to weather. I was just becoming as southern as possible. As I was thinking this, I noticed the name on the truck that started my musings was: ASAP. While the company was not referring to “As Southern As Possible” I did get a good laugh over how my brain was functioning… I didn’t even realize it was already a southern acronyms! 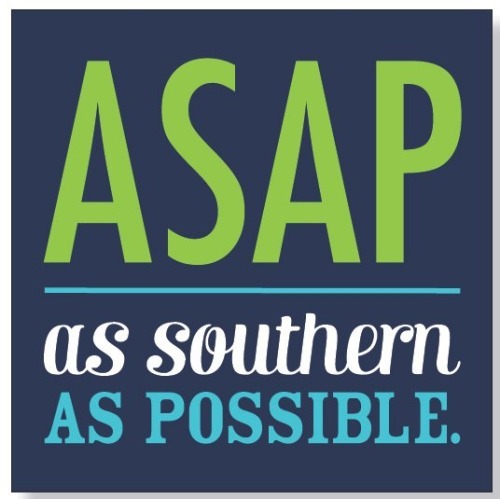 So ASAP: As Southern As Possible! And on a side note: what the hell is up with this damn weather? I am seeing pictures from my family up in Buffalo and it looks like the arctic. Down here in the south we had snow on Halloween and it is going to get down to 19 degrees tonight! IN NOVEMBER?! It is nuts! It is fall, not winter!